High quality windows at a great price with exceptional service from start to finish. The fitters, Liam and Dave worked really hard to get the job done with minimal mess and disruption, they are great lads and are a credit to the company. I like to support good local businesses and would highly recommend Irlam Glass. Really pleased with my new front door. Great customer service and great end result. As part of a new extension we has some large aluminium Bifolds + all house windows fitted by Colin. The service from start to finish was exceptional. During a very stressful time Colin took care of all the details from measuring the windows, ordering and installation. The price was also extremely competitive and by far cheaper than the other quotations provided by national companies. The quality of the doors/windows are of very high quality/standard. I would definitely recommend and use Colin again. Once again thanks for a fantastic job Iram. Exceptional service and materials. My wife and I try to use local suppliers whenver we can and Irlam Glass have been exceptionally good. The saleswoman was very professional and helpful. The price was far cheaper than the other three quotations we were give (by national companies). Delivery and fittings were within six weeks and the bi-fold doors are very high quality. The fitter was excellent and even swept up his mess. Great product, great service and would reccomend them. Used Irlam Glass before for full double glazing at the back and side of the house. Now used them again for work on the front. Grant was great and so was the rest of the firm. We had bifold doors fitted by Colin and his team as part of a newly built kitchen extension. The whole process was easy and trouble-free. We are delighted with the end result - the quality of the doors is excellent and we are particularly pleased with internal blinds. We would happily recommend Irlam Glass to anyone thinking about fitting something similar - they are a class act! After the frustration of dealing with a number of window companies I called Irlam Glass. Amanda came around to measure up and was very friendly and helpful. Colin and the fitters were superb, and an excellent job has been done. I am that happy with friendly and professional service, I have now asked them to carry out a re-fit on a facility I manage at work. From start to finish the customer service was great and there work is of a high standard. We are really happy with our French doors and the fitters left the area clean and tidy afterwards. We will definitely be using Irlam Glass again and I will be recommending them to everyone. We are very pleased with the work carried out by Irlam Glass, first they fitted a new window then a fan light which had to be made on site and finally we had a back door fitted. All these jobs have been very professionally carried out, the staff very pleasant and left the place clean and tidy. We would also like to thank Colin for his expert advice helping us choose what would be best for the job in question. We will have no hesitation in passing on your name and fully recommending your work, in fact we have already done this. We Had a back door fitted. Would definately use them if I have any more products needed. I had a composite door fitted in December, very pleased with the workmanship .very friendly staff and Colin,everywhere was left tidy and clean ,I would definitely use them again ,love my new purchase. Fantastic service, the handle on our window broke early Saturday night. We called Irlam glass (they fitted our windows) to see if anyone would answer and luckily they did answer. He came out to inspect the handle in under 15 minutes and made the window safe and secure. He returned next morning to replace the broken handle. Both me and my husband are so happy about his quick response and the care he took to reassure us that we were still secure. We are very glad that we choose Irlam glass to fit our door and windows. As the follow up care has been fantastic. Irlam Glass did a wonderful job on providing us with new windows, front door and French doors. Grant the fitter did an amazing job. He totally transformed our home. He puts so much effort into his work and has great pride in what he does, hence the amazing finished product. He was courtesy and always kept us informed of progress. Colin, the owner called regularly to check that we were happy with everything. The products from Irlam Glass are first class and very reasonable. I would highly recommend them. Best in the business. Thank you so much Colin and Grant for everything you have done for us. Truly grateful. Kind regards. Thank you for a great job in replacing Windows excellent front doors fitting with flush bottom door sill for a disabled resident . Finish and trim work around the door and Windows give the final touches to a top job . Fantastic 5 star service from Irlam glass,a very professional job was carried out from start to finish. We had our windows and front door fitted,and they look fabulous and are very good quality too. The fitters were amazing and everything was left very clean and tidy. In my opinion don't buy from anyone else,use Irlam glass. I cannot recommend them highly enough and I am a very fussy person. Thank you once again. Debbie. Excellent service from start to finish. Veryou pleased with all the work carried out by Irlam glass . Excellent team of fitters all areas left very clenched and tidy even the neighbours garden was cleared of any debris . Would highly recommend and use them again. First time I have needed new widows and doors and I decided to support a local business, very glad I did as the quality of the product's, the sevice and workmanship was excellent, job well done and will definitely be using again and recommending to anyone that needs their service. More than happy for anyone to contact me to confirm the above. I cannot recommend Irlam Glass and Colin enough. He arrived and fixed the window, and did a terrific job. I was very pleased with the work, and would definitely use their services again. Top Job. Irlam Glass have done an amazing job installing all my windows and back door, Colin was really helpful whilst I chose the lovely Irish Oak colour for outside and white inside. Nothing was too much trouble. The men who fitted them did a fantastic job, so friendly, efficient and hard working and amazingly tidy for the amount of work they had to do, even bringing their own hoover and ensuring carpets etc were fully covered too. It was a real pleasure to look after them with brews and butties. Would definitely recommend Irlam Glass. First class service and really good value for money, well done to all of the Team and the builder too. Really happy thank you so much!! Colin was very friendly, and always willing to help. Once we had decided on the windows and doors, it wasn't long til we organised a date to get these put in. It was a very quick and smooth operation. Fantastic service from start to finish. The quality of the windows is excellent and the price very reasonable. The fitters did a brilliant job and left the house spotless! We would definitely recommend to friends and family. We now have a warm home! Thank you so much. A very professional job, we've had a few windows, front door and back door installed. All work was carried out quickly with a good finish and no mess. Would definitely recommend this company. The windows we received are absolutely fantastic. They really make the space and we are thrilled. The fitters were brilliant, they didn't leave a scrap of mess when fitting and the finish was excellent. I would highly recommend them. I recently had new windows and doors fitted by Irlam Glass which have transformed the look of my house at a very reasonable price. The Fitters did a very professional job and left everywhere clean and tidy. The products used were of the highest quality. I wanted a front door which was a bit different from the norm and it is fabulous (thank you Val for suggesting that design). I would have no hesitation in recommending Irlam Glass to anyone. Thank you so much to Colin, Val and the fitters for a first class job. Thank you Colin & Team!!! We are now proud owners of a fab conservatory! Colin and team (including fitters, plasterers, electrician and flagger) all professional, organised and polite, Colin was contactable at all times and happy to answer any questions....a competitive price too! Would gladly recommend to any family and friends needing similar work. Where do we start, a huge thank you to Val, Colin and their fitters Mark and Steve. A fantastic local business. We had a new front door and four windows fitted within four weeks. What a difference it has made to our house. The quality of their products are superb. We have now just placed another order with them to have the rest of our windows changed. Thank you so much, we would recommend you in a heartbeat :-). What can i say, I had a new front door fitted and I am delighted. Colin emailed me back straight away with any queries I had. The fitter was brilliant did a great job, he was very friendly and curtious. He also tidied up after after he finished. I would definitely recommend this company and prices very competitive. Would give them 10 out of 10. A very professional job from start to finish, with it being a residential development extra caution had to be taken in regards to access/pedestrians. All balcony glass fitted and completed on the same day, very happy tenants. Had two big bay windows replaced by Irlam Glass. The two fitters were really nice and worked quickly and quietly. The job was very well done and they left it clean and tidy. Other family members have also used this firm . Would recommend them as also reasonably priced. Had some repair work and adjustments carried out to an existing installation. Colin always replied to emails quickly when enquiring and making arrangements, even out of office hours. I was kept updated as to when the fitter would arrive. A good job was done, fitter was helpful, and I even got a discount for being an existing customer. Would happily recommend. A very professional job start to finish, Good price, very clean job, fitted ahead of schedule and more then happy with the results. had 3 windows and a door fitted and will have further work done in the future. Irlam glass replaced five double glazed window panes. The price was very good. They turned up on time and did an excellent job. I would recommend them. Just had a double glazed front bay window fitted by Irlam Glass. The quality of workmanship and attention to detail is top class, the windows are fantastic quality and have transformed the look of the house (as well as eradicating the draught!). The fitters were very polite and courteous and real tradesman that take a pride in their work and did a great job of tidying up afterwards. No hesitation in recommending them to anybody. Many Thanks. Pauline Salmon November 2014. I needed a specialist job done so I contacted Irlam Glass. They made me a bespoke wooden frame window which had to have 7 stain glass windows put into the frame. First the old stain glass windows had to be repaired, cleaned and then put into new double glazed units. The workmanship was second to none, a fantastic piece of workmanship. They also beat all the other quotes I received. The Irlam Glass Team fitted windows and doors throughout the house. They were super efficient and did an absolutely fabulous job with top quality products. They arrived when they arranged to, we're extremely courteous and carried out the work at lightning speed. Would highly recommend them to everyone. Would highly recommend irlam glass, I had a side and rear extent ion (orangery) love both very much the company were extremely professional and the standard of work was excellent, I had other quotes from other bigger suppliers but irlam glass were much cheaper will use them again, irlam glass lads were punctual, courteous and cleaned up after themselves. The team at Irlam Glass replaced and installed 10 windows at a very competitive price for us. From the onset the company have been extremely professional and the standard of work was fabulous. I had a few other quotes from bigger suppliers but Irlam Glass were much cheaper and local so it made perfect sense to use a local business. I will be using them again for replacing external doors and for the extension. My neighbour has since also decided to use Irlam Glass as she recognised the quality of the work and the speed in which they were able to get the work done. They even bought Henry the hoover with them to clean up properly after themselves! I would highly recommend at the least getting a quote of these guys. They are very good. extemely professional could not fault them why arent all trades like this? We have had new doors and an orangery built by the Team at Irlam Glass. The team were great and always arrived when they should. The work was completed on time and to budget. Colin worked very hard during the consultation to understand our requirements and was full of ideas to enhance our build. Very very pleased with the final result. I would certainly recommend and wouldn't hesitate to use them again. I can confirm that we can highly recommend Irlam Glass. They replaced 2 sets of doors for us, including double doors for a garage. They also provided broken-down, written quotes for further work. They proved themselves to be trust-worthy, fast, efficient, neat and not-least, most patient with a demanding customer! We had our front door replaced by composite door by Irlam Glass. The customer service was great and the quality of the job tidy and precise. Highly recommended! I'm very impressed by the work carried out by the irlam glass team I've had new windows and doors fitted and it has made a huge difference to the look of my house and the heating bill. The irlam glass lads were punctual courteous and cleaned up after themselves. Excellent service and would definatly recommend them!! This company have done work for us at several developments across the Northwest to a very good standard. I have used Irlam glass several times on my rental properties .They always do a good job and always have good prices . They are just doing a job in Wigan for me and again are doing a good job. I would happily recommend them . Have nothing but good things to say about Irlam Glass, they were always very prompt, did an excellent job and most of all I was very happy with the price. Will always, and have done, recommend Irlam Glass. I've used Irlam glass on a few occasions and am very pleased to say I am always very satisfied with their work. I've always received a friendly, reliable and quality service at a reasonable price hence why I have used them on numerous occasions. Great company, very professional. Very friendly service, will definetly use again. 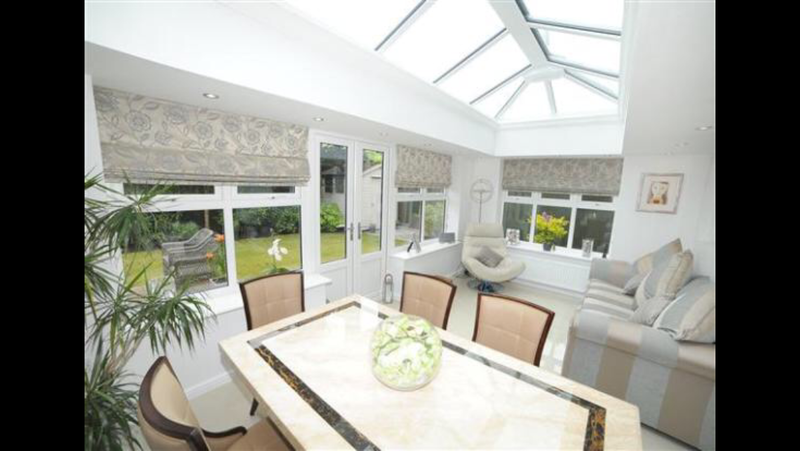 I am very pleased that we chose Irlam Glass to provide and install our conservatory. It is a great addition to the house and has been used almost daily since it was built about 3 years ago. I found the workers who installed the conservatory to be very pleasant they arrived as planned and the quality of the conservatory is excellent and extremely good value, I would happily use Irlam Glass again and have recommended them to others.